As visitors to Costa Rica we are required to exit the country every three months for 72 hours before we can return. Liberia is only one hour away from the Nicaragua border and there are a number of ways one can cross the border and come back in one day with the required passport stamp. It’s not exactly legal but it is doable, however John and I wanted to see a bit of the country. We heard that the country side is beautiful and there are a number of wonderful sights to be seen so we checked around with a couple of the tour operators in town. Most of the tours offered were only 1 day trips which we thought would be too hectic and sounded too much like work. We were hoping to do 3 days to for a more relaxed trip and have more time to see places other than the regular tourist traps. Some operators suggested they could take us across the border and then pick us up a couple of days later but we wanted someone who spoke the language and knew the lay of the land. We checked out the Blue Marlin which offers mostly fishing charter but Juan Carlos recommended someone who could do custom tours and that was how we met Chico. Francisco, known as Chico to his friends, came and picked us up at the condo at 6 AM. This would give us plenty of time to pass through customs at the border which can be difficult unless you know the ropes. The trip to the border was a pleasant surprise. There were a number of large farms with Brama bulls, sabaneros (cowboys) and beautiful scenery. There is a ridge of volcanos that run down the middle of Costa Rica and people say that when they blow the country will be split in two and one side will be called Costa and the other, you guessed it, Rica. We had breakfast at the border buffet restaurant which offered gallo pinto, eggs, fruit, fried chicken etc and does a booming business with the traffic that crosses all day long. Chico leaves his car at the customs lot in Costa Rica and rents one in Nicaragua as they would charge him a tax of more than $50 US a day if he took his own across. 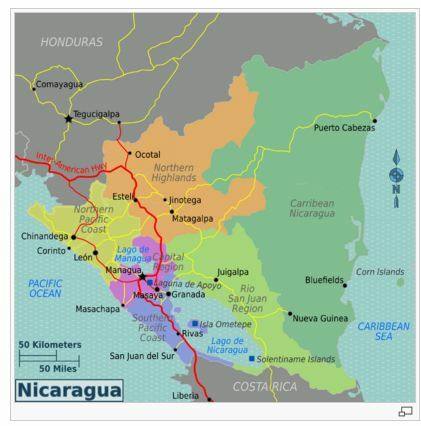 To get into Nicaragua one needs to exit the CR customs and then enter on the other side paying fees on both sides of course…..seems like governments across the world love to collect money. Then it’s a quick walk across the border to pick up the car and Rudolpho. Rudolpho is a Nico associate of Chicos who speaks excellent english and is extremely knowledgeable about all things Nicaraguan. He is going to spend the day with us, along with Chico, pointing out all the sights as we tour around and giving us insights into the culture, economy and politics of the country. 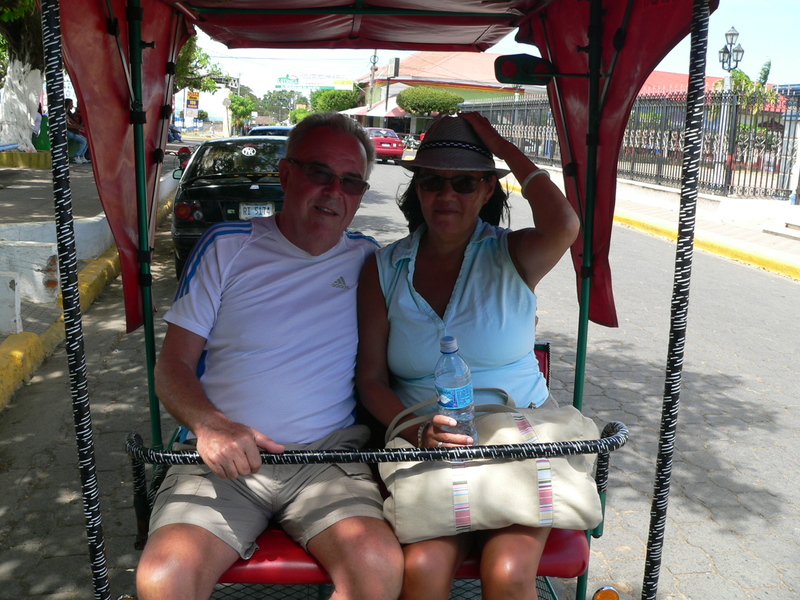 First stop…San Juan del Sur. 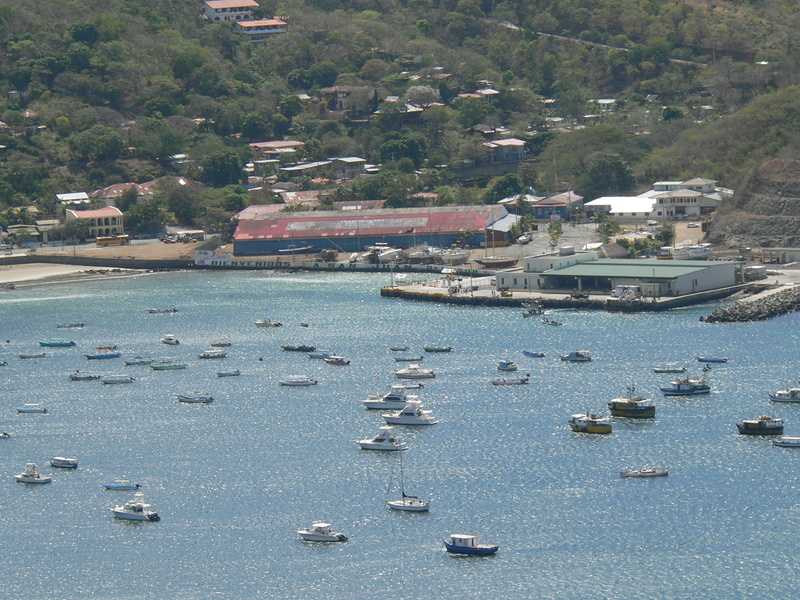 This is a small fishing town which is popular with bathing beauties, beach bums and surfers. There are a number of small hotels and cafes along the beach and has a growing tourist area. 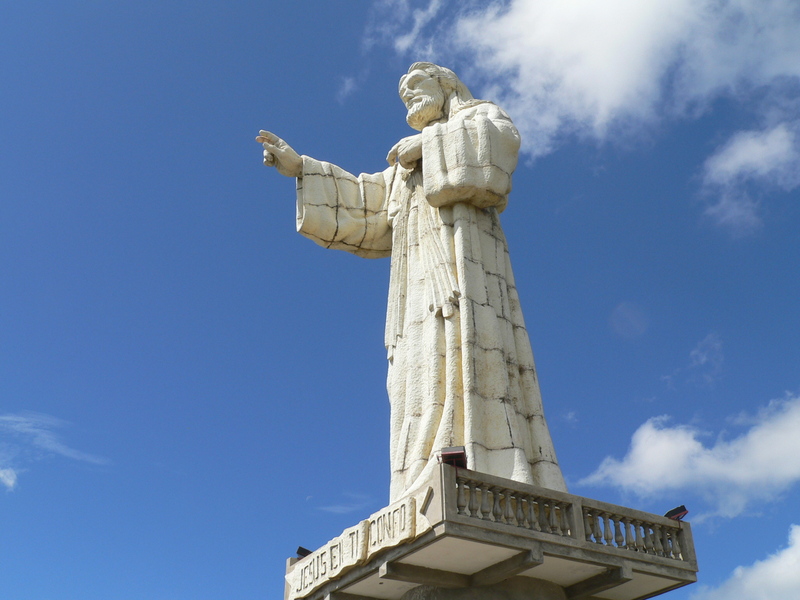 On top of a hill, just outside of town, there is a huge statue Christ of the Mercy that overlooks the harbour. It was built by a very rich Nicaraguan gentleman who had cancer and promised to build the statue if he survived. You can drive up part of the way but near the top you need to climb a steep hill to reach the top but the view is amazing. The statue is 24 metres high and when the clouds are soaring above when you look up it feels like you are moving as well. Driving in Nicaragua is a real treat as the main highway was only recently completed and is in much better condition than any in Costa Rica. There have been significant improvements to life here after the end of the civil war between the Sandinistas and the Contras….remember Ronald Regan and Oliver North. 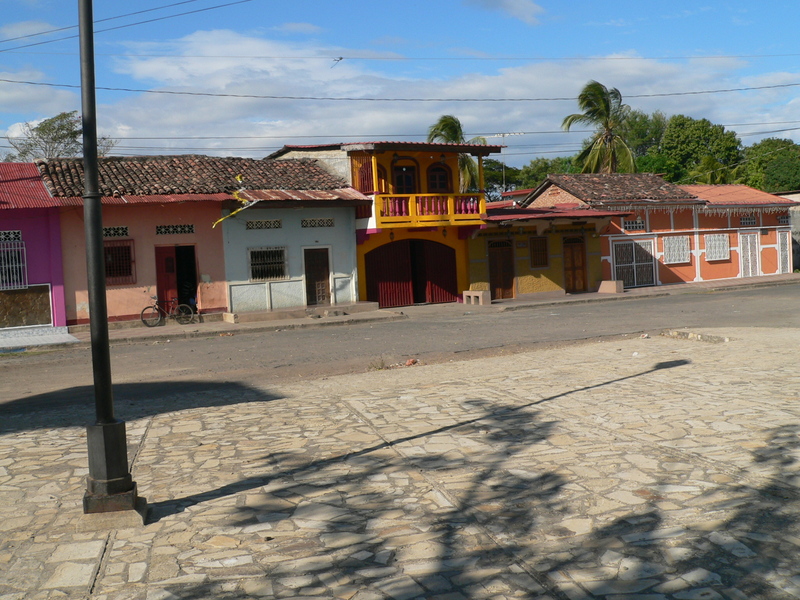 Daniel Ortega is in his third term as president which is against the constitution but life still goes on. 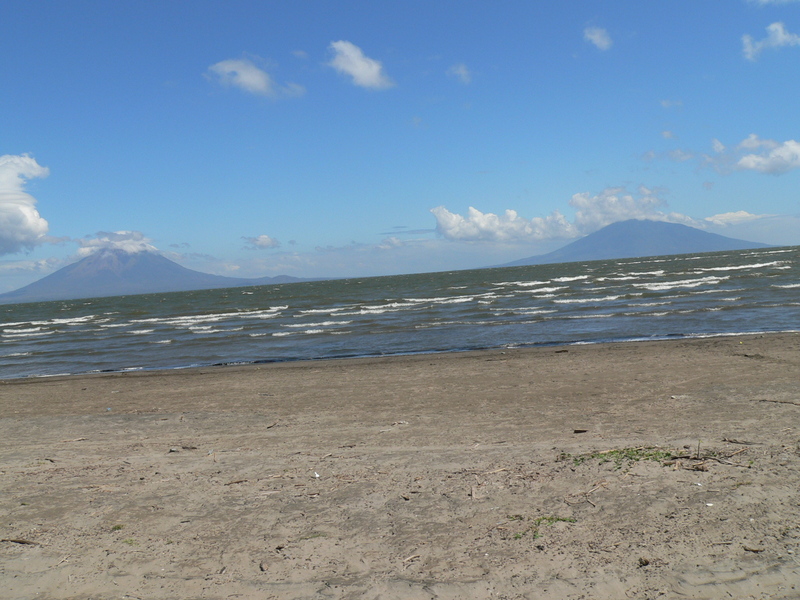 Traveling from San Juan del Sur, en route to Rivas, we pass Lake Nicaragua which is one of the largest fresh water lakes in the world. It is also the only lake with bull sharks which apparently swam up the river from the Pacific Ocean and became acclimatized to the environment. 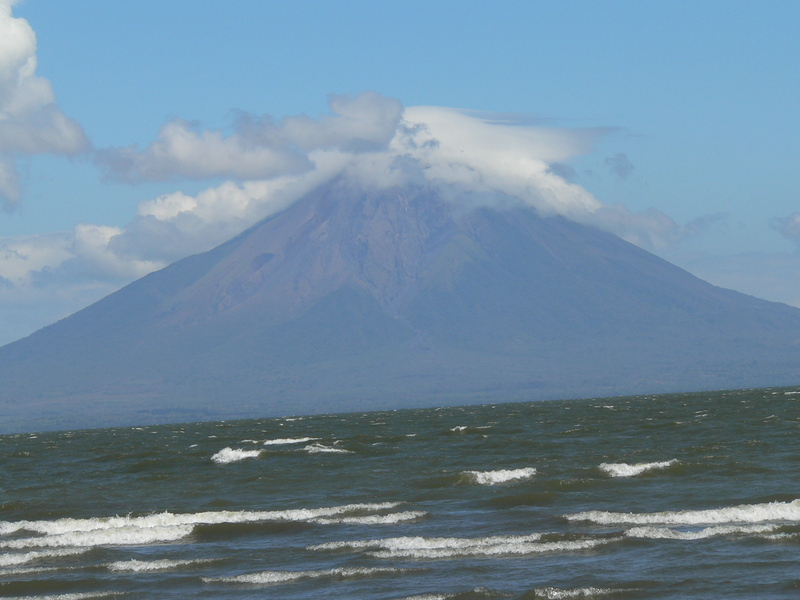 We also pass Isla de Ometepe which is an Indian word from Ome (two) and tepeti (moutains). The island was formed by two volcanos rising from the Lake: Concepcion which is an active volcano and Maderas which is not active. You can see the steam rising from Concepcion on the left. The wind was blowing like crazy and there were large waves and white caps on the lake. 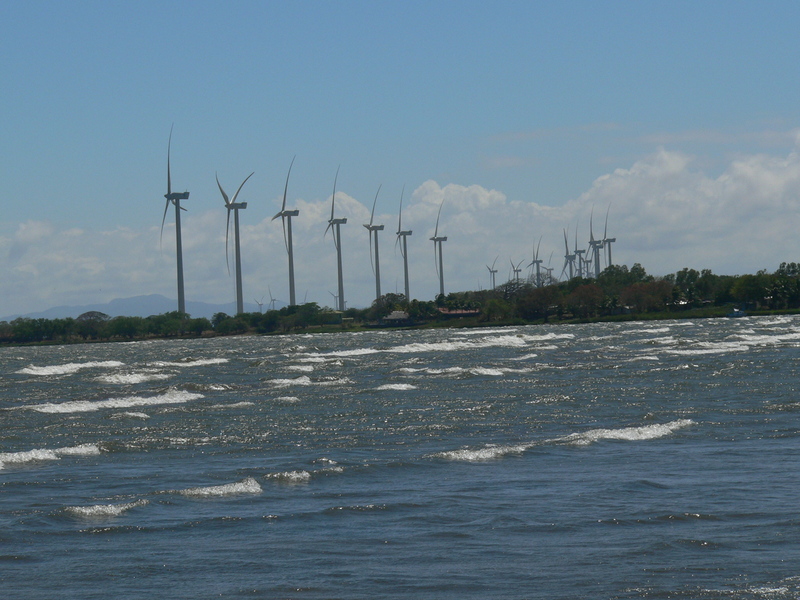 There are a number of windmill developments along the lake which is a perfect set up with the huge winds that blow here. This development is a joint project with a Spanish company. On our way to Rivas the guys are kidding us that we have to ride bicycles through town. We were a little apprehensive as the temperature was around 35° C and much too hot to do any cycling. Boy were we relieved when we found out that we are taking a bike cab with William doing all the work. Rudolpho is from Rivas and William is a buddy who took us on a tour of the town. 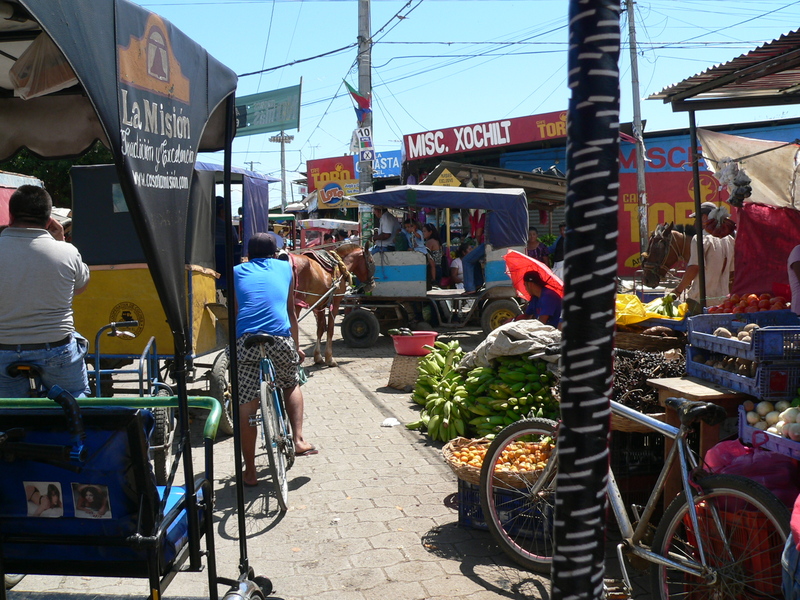 The market is crammed with all sorts of street vendors selling everything from food, clothing and souveniers. The work is hard and William was soaking as he pushed us across intersections, up small hills and had to stop occasionally to avoid running into people or other cars. I asked Rudulpho if the bicycles had right of way and he laughed and said” who ever gets there first”. Passing this church with the doors open William recommended that we go inside and take a look. It was certainly worth the stop. 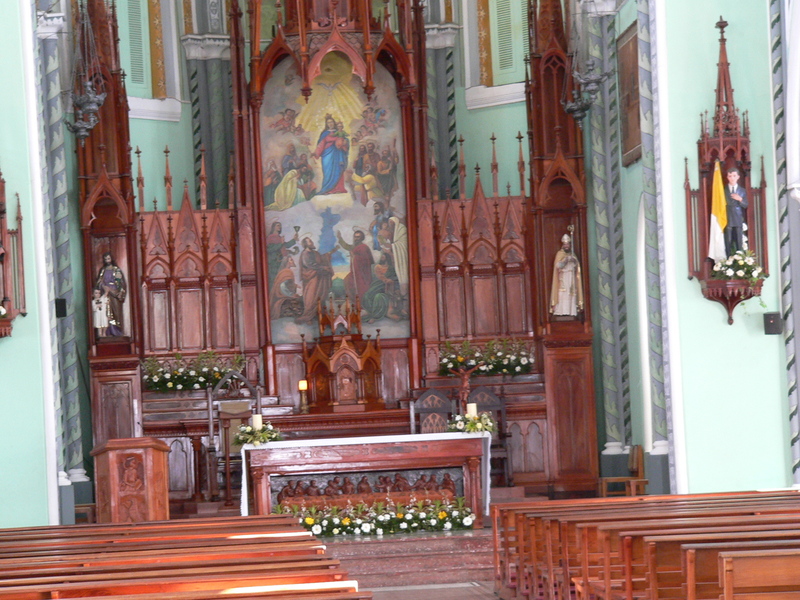 Even in this small town the church is very beautiful and ornate. We are starting to get hungry by this time and we stop at a wonderful restaurant not far from town (sorry didn’t get the name). Chico and Rudolpho recommended the 12 oz steak but neither John or I thought we would be able to finish it so instead I ordered Arroz con Pollo (Rice with Chicken) and John had the grilled Mahi Mahi. There was probably enough food to feed 10 people. The currency in Nicaragua is Cordobas , with 24 C to $1 US and each dish was only around 200 C which is approximately $8 US which was a great deal for the great and plentiful plates. John tried the local beer Tonya which is light and has 4.2% alcohol. Next stop Granada which is a main attraction due to it’s colonial buildings and historical importance. 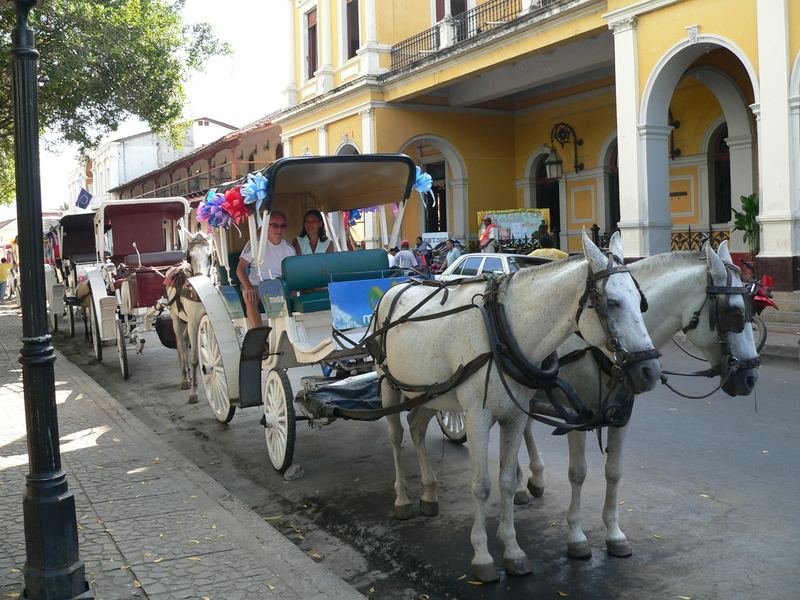 http://en.wikipedia.org/wiki/Granada,_Nicaragua One of the highlights is a horse drawn carriage ride through town. Rudolpho arranges it with another of his pals and comes along to help with the language issue and highlight some of the spots. These horses await right next to the central park which is a feature in almost all the towns. There are a number of souvenier stands, hotels and outdoor cafes all around. 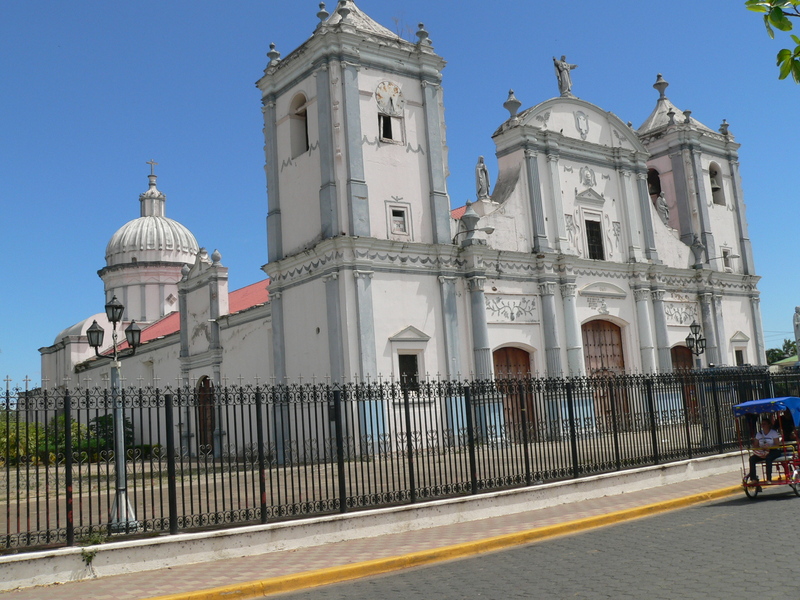 Nicaragua is predominantly Roman Catholic and there are a number of churches and cathedrals in every town. This is one of the oldest churches in Granada. All the houses in Granada are built side by side with large beautiful wood doors with ornate gate fences and little windows so you can see who is at the door before opening….similar to the peep holes in doors in apartment buildings. Inside the richer houses there are a number of rooms and a grand court yard in the centre with colourfull plants and occasional water fountains. The homes are all painted different colours and may identify the family living inside. After a long day we are getting tired and head off to check into the hotel and Rudolpho heads back to Rivas by bus. 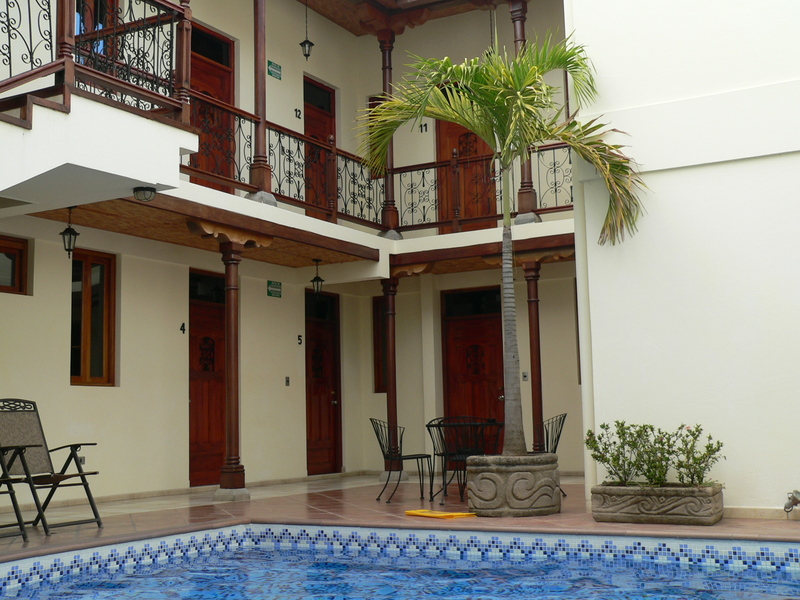 We are staying at the Hotel El Almirante which is a lovely new hotel with a lovely courtyear with a pool, bar and restaurant. http://www.hotelelalmirante.com/ John decided to take a dip in the pool and relax a bit in the courtyard. We had tacos for dinner at one of the cafes near central park as we were all still stuffed from lunch and then it was off to bed where we slept like logs. A wonderful day’s adventure and looking forward to tomorrow.